Literature-based activities help children connect their story book experiences to another from of expression. Encouraging children to do activities that relate to a book that has been read to them makes their learning more concrete. Also, look for ways you can relate characters, places, or actions in the story to real life experiences. If you've read a book about a farm, remind your child about the time you went to visit Uncle Harry. Or if the story was about animals, talk about your last trip to the zoo. Maybe you took photos. Are any pictures of the animals in the book the same as the ones in your photos? The children can make a colorful border for their own pictures as illustrated in the story. Draw a one inch border around bright colored construction paper. Use a hole punch t punch holes random between the margin and the edge of the paper. glue a constrasting color of construction paper behind the hole-punched page. Glue this onto the construction paper leaving the colorful, dotted border exposed as the frame. Try this activity to reinforce letter recognition while encouraging movement. Place a long, slightly sloping piece of masking tape on the floor to represent the coconut tree or make one out of brown paper and tape it to the floor. Use magnetic letters, letter blocks, or make your own from paper. Give each child a letter or group of letters, making sure they know what letter they are holding. 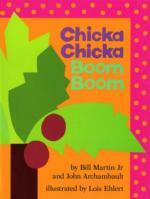 As you read the story, have each child climb (walk) up the coconut tree, then fall down. Encourage each child to do the motions as you read their letter. Be sure to encourage the children to say the chant with you. This activity is ideal for a group of children, but can be modifieied for one child by convering it to a table top version or reading the story more slowly to allow one child to do each letter. Try this recipe for a yummy way to reinforce letter recognition. Remember to have everyone wash their hands prior to any cooking project...food safety first! Open package of frozen bread dough and let thaw on a clean work surface. Spray a light coating of cooking spray on the baking sheet. Set aside. Sprinkle 2 tsp. of flour on work surface. Roll each dough into a rope about 18-inches long. Cut the ropes into 3 shorter ropes about 6-inches long. Place the shortened ropes on the baking sheet. Form letters with the ropes of dough. Place the baking sheet in a warm place for 30 minutes to let the dough rise. While waiting, crack open an egg. Separate the egg white from the yolk. Place the yolk in another bowl to save for another recipe. Add water to the egg white and whisk until fully mixed. When the dough has risen for 30 minutes, brush the egg white mixture on each letter for a shiny glaze. In a second bowl, combine sugar and cinnamon. Sprinkle mixture on the letters. Place the baking sheet in the oven and bake for 15-20 minutes or until golden brown. Using an oven mitt, remove the baking sheet from the oven to cool in a safe place. When cool, remove the letters from the baking sheet with a spatula. Arrange the letters on a serving tray to spell names, words, or children's initials. Eat the sweet letters as a snack, dessert, or party treat. 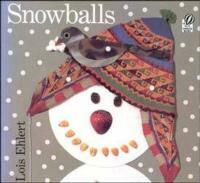 Here are a few activities to try after reading Lois Ehlert's Snowballs. Glue or staple together different size paper plates to make snow people to represent the people in your family or center. Glue on many different items as they did in the book to personalize your creation. Tip: Flattening the paper plates first allows for better crafting. Smear peanut butter on a pine cone. Then roll it in bird seed to create a yummy treat for the birds that stay around during the winter months. Use a sturdy piece of string to hand it from a tree. Be sure to place it where you can watch the birds feed. Create a snowy winter scene by gluing cotton balls on a piece of blue or black paper. Children can draw any additions to make their picture unique. Extend the activity by having the children make up a story about their picture. On a separate sheet of paper, write their story (or assist them and display it with their picture. To make a paper snowflake, cut a circle from a sheet of white paper. Fold the circle in half. Fold in half again so that you have a pizza-shaped wedge. Cut shapes along the edges. Open it to reveal your beautiful snowflake! He's all gone, he's all gone. Preheat the oven to 400 degrees. Combine butter, sugar and vanilla in the bowl of food processor (or in a mixing bowl with a mixer). Add flour and salt. Pulse until dough forms. Shape the dough into walnut-sized balls. Place the dough balls on a ungreased cookie sheet. Bake until set about 9 minutes. Do not brown. Roll the warm cookies in powdered sugar. Store in a airtight container. To freeze, layer the cookies between sheets of parchment or waxed paper.